Cut potatoes into equal peices and boil until soft. Chop chicken breasts into equal chunks. Bring oil to med high heat in a high sided frying pan or large pot. Add the chicken with a little salt and adgitate until brown on all sides. but it makes the flavors really wonderful in the end so it is worth it). 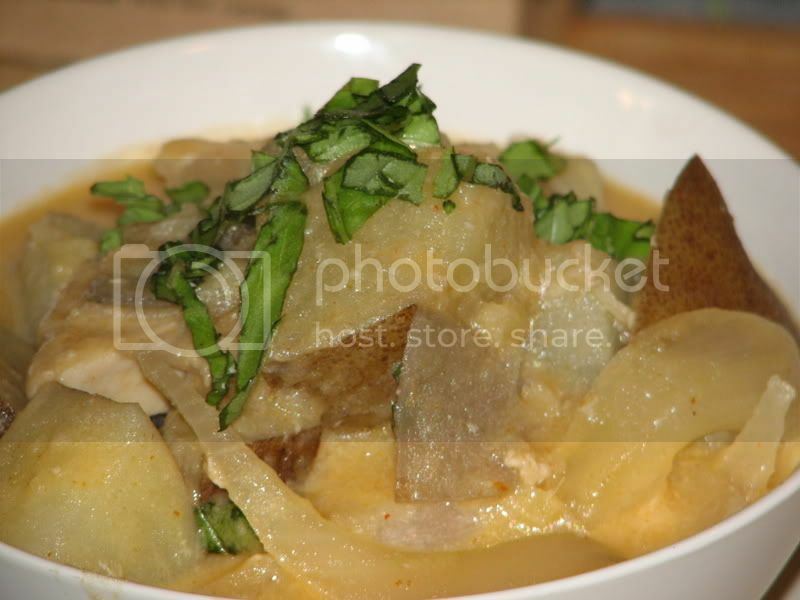 After a minute add the coconut milk, 1/2 a can of water, bamboo shoots, onion (cut into slivers) and cooked potatoes. Bring to a boil and add sugar cane/brown sugar. Allow to simmer for about 10 minutes to let the flavors meld. Just before serving toss with 1/2 the chopped basil. Serve with the rest of the basil as garnish.